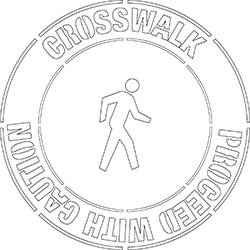 Using a stencil to mark your floors with a message saying, “Crosswalk – Proceed with Caution” is a great way to improve visual communication and safety. If you have any crosswalks in your facility, then you will want to make sure that people know where they are and that they have to proceed with caution to avoid accidents and injuries. Putting this simple stencil down and painting over it will leave a long lasting message that will remind everyone to take proper care. Many people think that when entering a crosswalk that they don’t have to watch out for vehicles and that they always have the right of way. Even when they do have the right of way, the pedestrian needs to always be watching out for vehicles in the area to help ensure they don’t get hit. This stencil makes it easy to ensure people are always looking around when using the crosswalk.